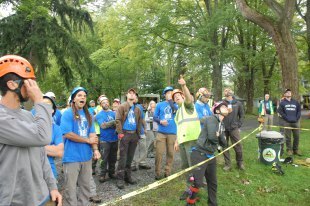 If there’s one thing that wasn’t going to stop us from having fun at this year’s Penn-Del ISA Tree Climbing Competition, it was the rain. I already knew the competition was going to be epic when a few days prior, through a private group text message, I saw that the legendary Jim Savage was going to, out of the kindness of his heart, take a long road trip out to Pittsburgh and pick up the competition trailer so that we could have it at the beautiful and historic Boal Mansion in State College by Friday before the competition. If anyone knows Jim Savage, this kind of thing wouldn’t surprise you in the least bit. His passion for the site really shined through again on Saturday, the day of the competition, when he was giving a public history lesson to competition spectators about the incredible history of the Boal Mansion, the priceless artifacts and stories it houses, and the amazing mystique of the Boal family as well. The scene was an absolute natural history come alive. That’s only one example of the many instances I saw people giving selflessly all weekend long. Geoffrey Manning brought his apprentice climber, Austin Mobley, all the way from Virginia to compete with many other out-of-state climbers like Doug Ralph and Brick Reilly from the New Jersey chapter. Austin, Doug and Brick stole many prizes from the podium, with Austin being named first place Apprentice climber (out of several first time competitors, an encouraging statistic in itself). But they also contributed to the spirit of the competition in other ways, with their energy and friendship, and their professionalism and encouragement for others, and their great skills challenging other competitors to step up and be better. The rough bark on the Black Walnut in the Throw Line Event broke many hearts, snagging even the slickest lines of climbers and keeping many throw line scores at bay. But my good friend Archie Autenreit, also a board member of the Penn-Del ISA, told me in secrecy Friday night that he came to take the throw line event. It was a daring and bold statement, but one in which Archie backed up, earning himself first place in that challenging test of grit and grace. But Archie also won another prize, even more special because his fellow colleagues and competitors chose it for him: The Spirit of the Competition. If you’ve ever climbed or worked with Archie, you know that he gives his expertise and encouragement endlessly, constantly sparking the inspiration in those around him. Archie Autenreit, Winner of the Throwline event and the Spirit of the Competition. Speaking of effort, I can’t talk about the competition without mentioning my good friend Jake Riggs, one of the best tree climbers I know. It’s no surprise that Jake finished first overall. That’s because he gives one hundred percent all the time, the way he works and the way he prepares himself to compete. His excitement is an inspiration, and his love and obsession for tree climbing is infectious. In this way Jake makes us all better by example, by showing us what it takes to be the best. We’re all chasing after him, and getting the best out of ourselves because of it. Maria Tranguch finished first over all for the women’s division which also included Rachel Brudzinski. Both women will be climbing in the Master’s Challenge Event (which was postponed to the spring due to the rain). This is, as far as I know, the first time the Penn-Del Master’s Challenge will have two women climbing and vying for a spot at the International TCC in 2019. Maria and Rachel are both great tree climbers and role models for everyone working in arboriculture. They are truly masters of their craft. Jake Riggs and Maria Tranguch, overall winners of the preliminary events at Penn-Del this year, celebrate their honors of winning first place in the Team event at the ITCC earlier this year in Columbus, Ohio. Another longtime friend, Mark Moeske, came all the way from New York, as he has so many times in the past, to give his time and his energy as a volunteer. Mark had some words of wisdom for everyone in attendance at the award ceremony. And of course, it was about giving. He encouraged us to offer more of our knowledge as professionals to our colleagues that need it. Essentially: change the things we don’t like about poor work practices-to make our industry safer, better, we must become more tight-knit, and more willing to share. Thanks for picking us up and helping out Mark (the guy from New York). 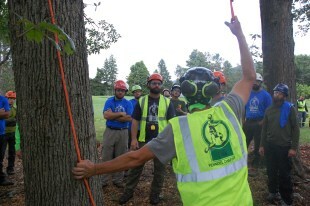 And how can I not talk about the legendary Glen Riggs, our tree climbing competition chairman at the Penn-Del chapter. Glen has a large-than-life personality, and his spirit for the competition is stronger than anyone’s. Glen is one of the many reason’s that the competition is what it is. Even afterwards, in the late night hours where we gathered as friends and colleagues for food and spirits, there was Glen giving us advice on business and life from his own hard knock experiences in tree work. I laughed so damn hard I cried. And if anyone knows Glen, much of it I can’t put into print. Here we were, champions and volunteers and apprentices alike, no black ties or secret meetings, just tree folks from this state and the next with greasy burgers and cold beers, taking care of each other, giving some advice and taking even more of it. It couldn’t have worked without the entire community sticking it out and making it happen, despite the weather. Many thanks also to Dave Ruyak who managed the scoring station, and who is always working hard behind the scenes and in the field to make the chapter better. Other absolute legends in their own time in the arboriculture industry: Paul Biester, Bert Kuhn, Rick Yoos, Jim Roach, Kris Edson, Pete Nieves-Sosa and all of the judges and volunteers who’s name I forget but whose personalities are such a vital part of this wonderful public celebration of climbing arborists. 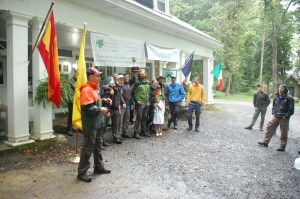 Jim Roach walks climbers through the details of the Work Climb Event. Legends of the Penn-Del chapter Rob Thigpen and Garreth Peoples answering some technical questions at the Aerial Rescue Event. Derrick Martin letting it flow. I don’t know, maybe there’s just something more real about climbing in the rain, especially a cool, early September rain that chills the bones. It’s good for the ego, at least. But maybe it’s not being in the rain that really matters. Maybe it’s just being together with each other, the people we live and work and laugh with. Our families and friends and mentors. In closing, I’d like to share something very special that I saw late Saturday afternoon in the gloomy, wet, lonely atmosphere that follows a tree climbing competition in the rain. Everyone was long gone except a few people that no one notices. The events are packed away, the prizes are awarded, the pictures are taken, and the food truck is closed. But I saw a little something about giving that was truly special. It was Rick Yoos, helmet on and bundled up proper for the weather, under the ancient oak tree that hosted the Work Climb Event. And here was Rick, a volunteer all the way from southern New Jersey, on his own dime and his own time, raking up leaves and twigs underneath the crown of this amazing tree. No one to see. No one to care. And not even because he had to. Rick Yoos was simply leaving this place a little better than he found it.